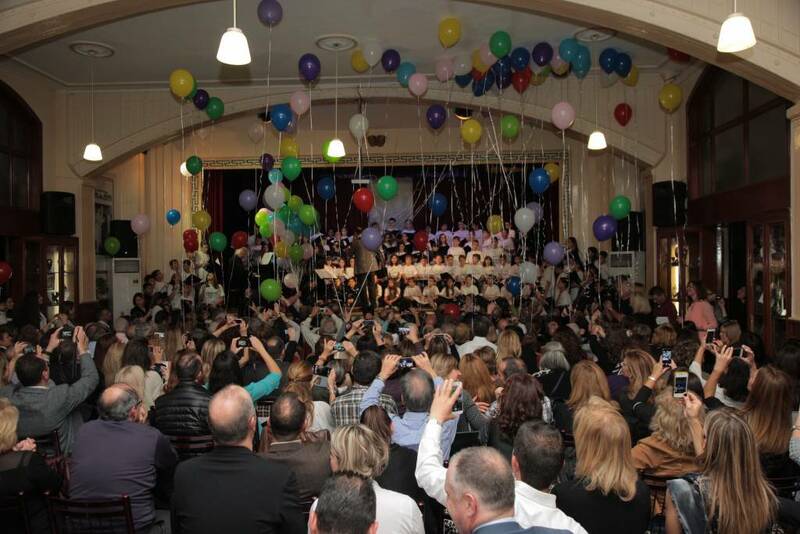 The celebration of 35 years of the operation of Mandoulides Schools and their contribution to education and culture was brightened by the presence of His All Holiness, the Ecumenical Patriarch Vartholomeos. Students, parents, friends and colleagues of the Schools had the honor and pleasure to receive the blessing of His All Holiness on the premises of the Junior - Senior High School. 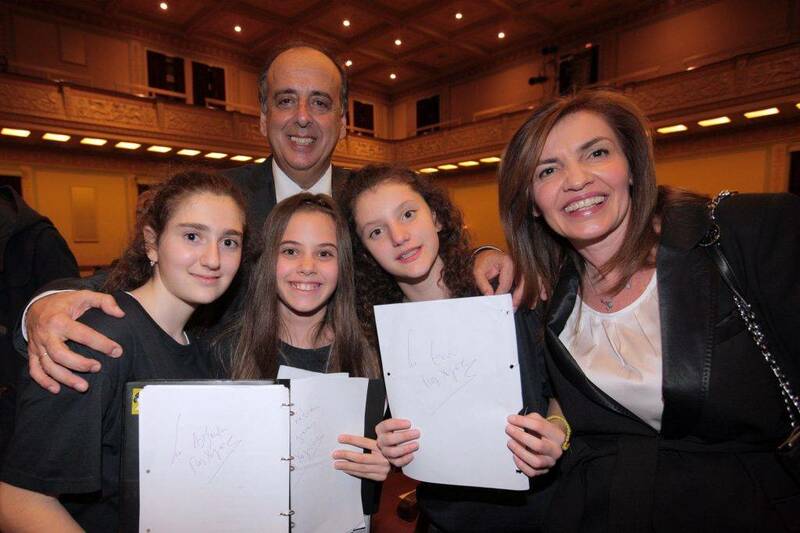 Afterwards, the musical "A Magical City,” based on the fairytale of Eleni Priovolou and written specifically for this performance, was presented, starring students of the Zografeio Lykeio and Mandoulides Schools Elementary School. 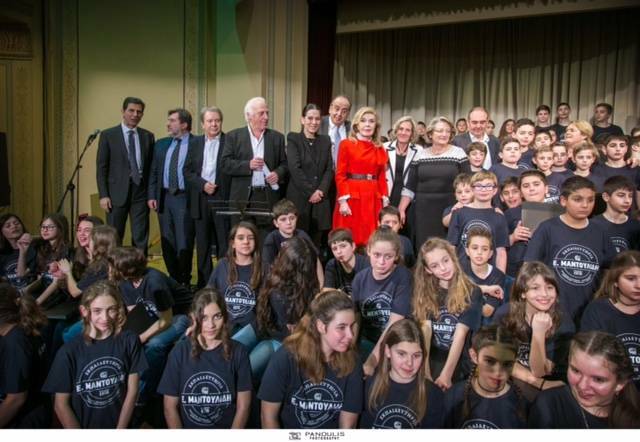 To commemorate 30 years of creativity and contribution of the Schools to education, Mandoulides Schools held two events: a concert honoring Dionysis Savvopoulos on March 15th 2009 in collaboration with the orchestra and choir of Mandoulides Schools; and a 2-day conference titled "School 2009: Culture And Language - a Tribute to the Founder, Evangelos Mantoulidis" held May 15th - 16th 2009. 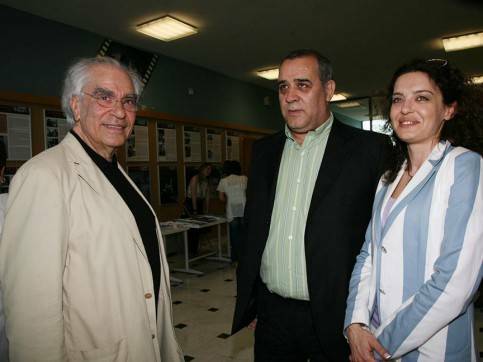 The conference titled "School 2009: Culture And Language" began on Friday afternoon, May 15th with a tribute to the founder, Evangelos Mantoulidis. 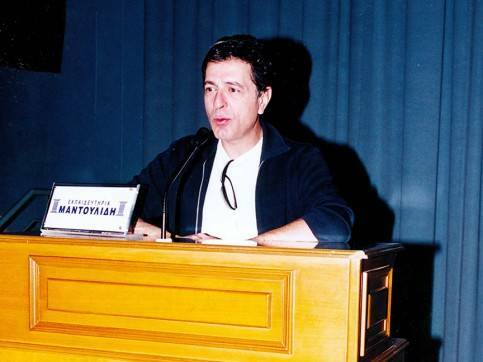 Colleagues, friends, associates, and students spoke about the life and work of Evangelos Mantoulidis. 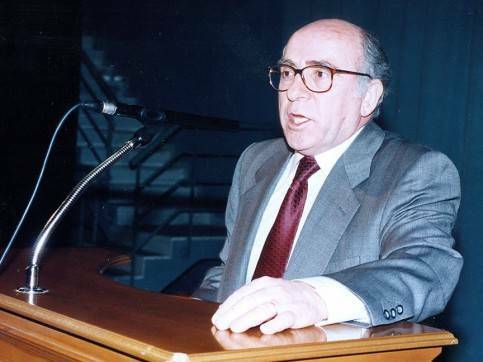 Savvas Anastasiadis, Prefectural consultant - President of the Management Body of the Koroneia and Volvi Lakes, spoke about the man, Evangelos Mantoulidis. 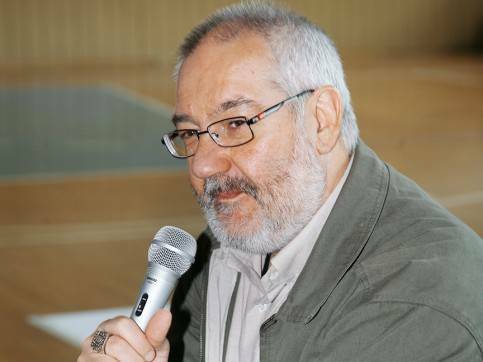 The Regional Director of Primary and Secondary Education of Central Macedonia Georgios Karatasios mentioned the significant educational contribution of Evangelos Mantoulidis. 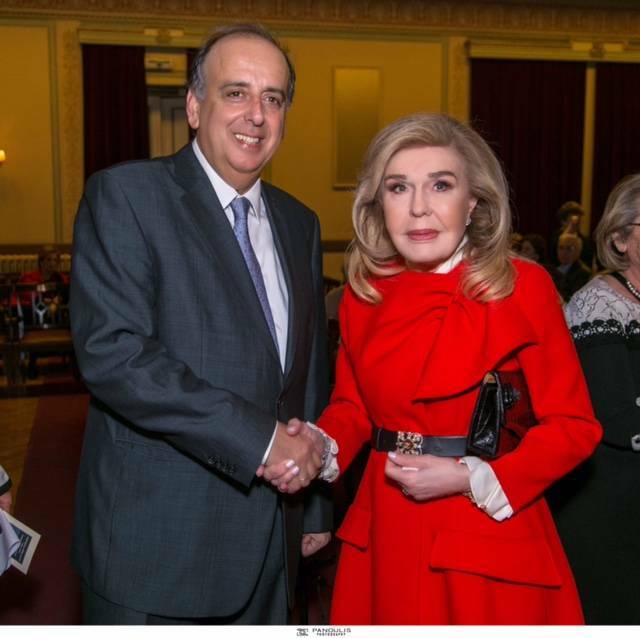 Nikos Karatzas, President - CEO of Ianos S.A., spoke of his "friend, Vangelis Mantoulidis," while Sarantos Kargakos, historian and author, highlighted the spiritual and educational work of Evangelos Mantoulidis. 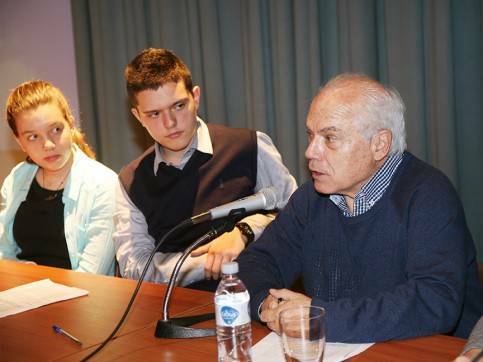 Vice President of the American College Anatolia and mathematician Georgios Lysaridis talked about "the man and friend Evangelos Mantoulidis" while Eva Tsoukalidou, economist and graduate of Harvard University and Aristotle University School of Law, who met him as a student at Mandoulides Schools, spoke on the topic "Evangelos Mantoulidis, Our Signalman." 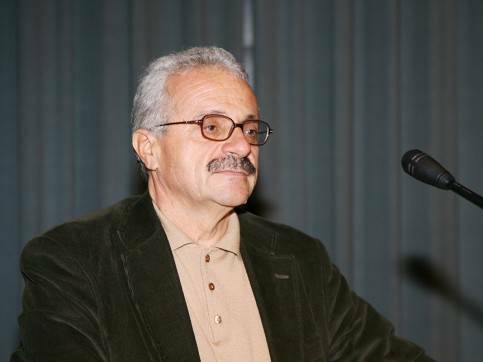 Finally, Emeritus Professor of Modern History at Aristotle University Ioannis Hasiotis focused on "Ideology and Practice in the Educational Path of Vangelis Mantoulidis." 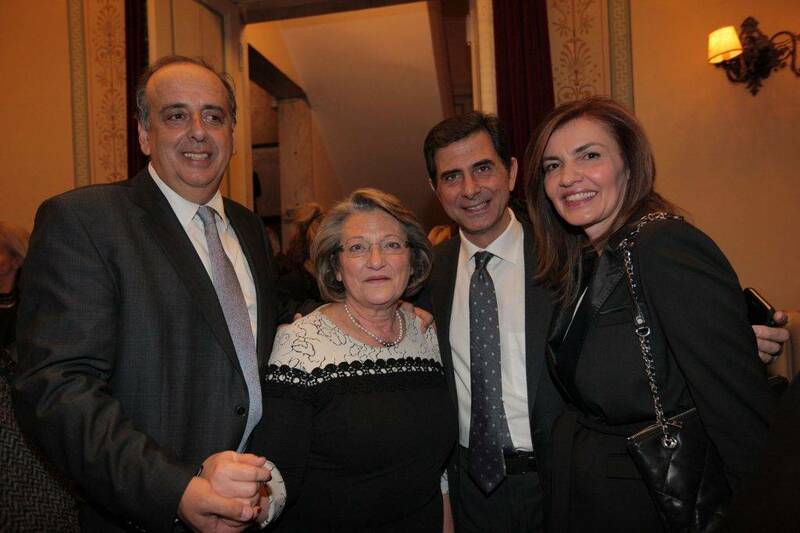 Greetings were given by Minister of Macedonia - Thrace Stavros Kalafatis, Prefect of Thessaloniki Panagiotis Psomiadis, and Mandoulides Schools President Mrs. Aikaterini Mantoulidou. 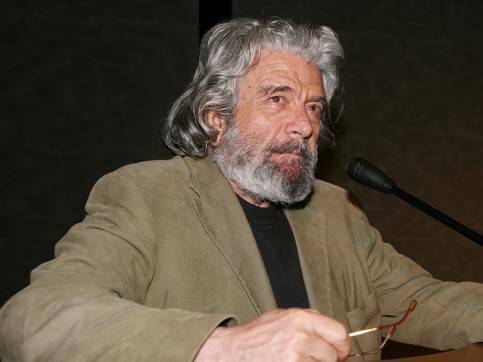 The event ended in a heartwarming atmosphere with the concert of Loudovikos of Anogion, whom Evangelos Mantoulidis appreciated both as a person and as an artist. 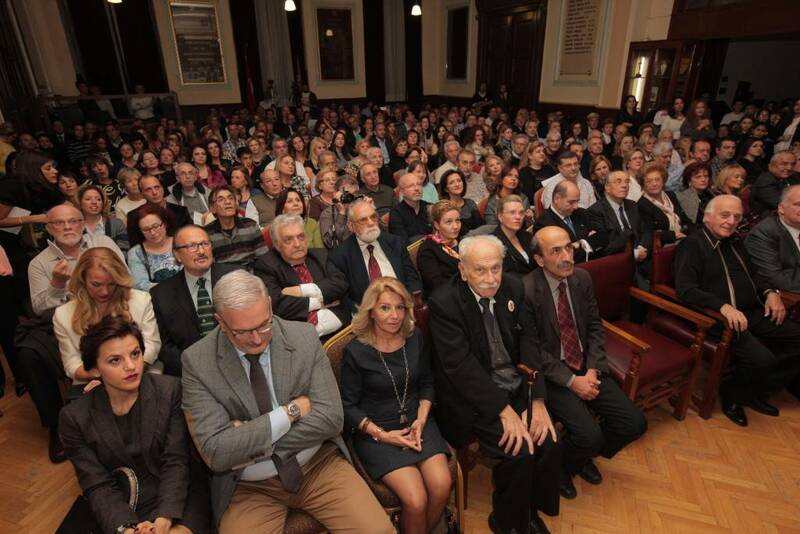 On Saturday morning May 16th, the conference on "Education and Language" with lectures by leading public figures and men of letters began with the participation of ministers, MPs, representatives of government and education, and hundreds of university teachers and friends of Mandoulides Schools. 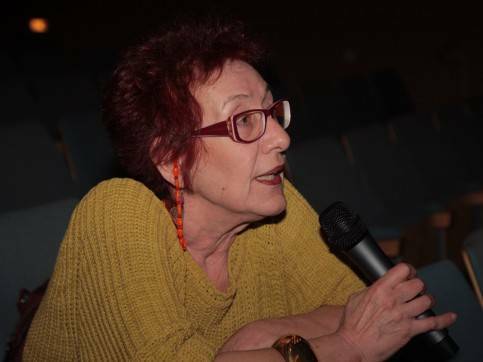 The opening speech for the conference was given by the former Minister of Education Marietta Giannakou, who addressed the European dimension of the Greek language. 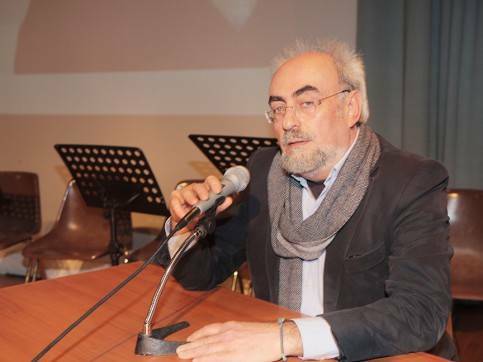 Ioannis Kazazis, Professor of Classics at Aristotle University and Associate President of the Greek Language Center, spoke on "The Streets of Words: Philology and Culture in School Practice." A speech by Georgios Papanastasiou, Assistant Professor of Linguistics at Aristotle University and Director of the Institute of Modern Greek Studies (Manolis Triandafyllidis Foundation), followed, who expanded on the theme "The Greek Language through the Ages: Educational Issues." In the second session, Christos Tsolakis, Emeritus Professor of Modern Greek at Aristotle University, spoke on "Language and Culture," while Christos Giannaras, Emeritus Professor of Philosophy at Panteion University, addressed the topic: "Language: the ‘Land’ of the Greeks.” In the third session, speakers were author Theodoros Ziakas, with the theme "Modern Nihilism and Education," and 2nd Office Head Apostolos Apostolidis, who spoke about "Silent Praise." The conference ended with a lively discussion on the role of teaching Ancient and Modern Greek within current Greek education. 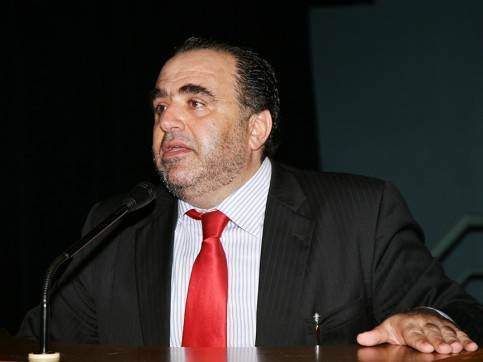 Minister of Internal Affairs Konstantinos Gkioulekas addressed brief remarks to the audience at the conference which was held under the auspices of the Prefecture of Thessaloniki. 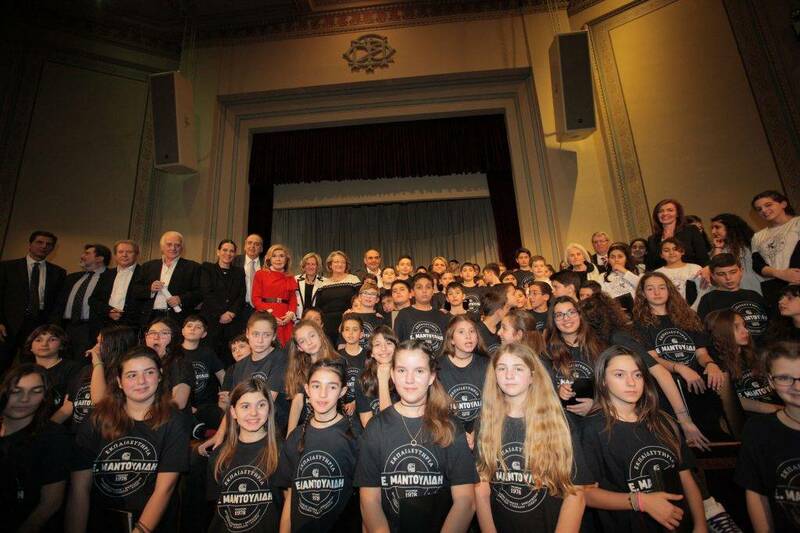 Mandoulides Schools held a concert honouring Dionysis Savvopoulos on Sunday March 15th 2009 in collaboration with the orchestra and choir of Mandoulides Schools. It was a memorable evening full of memories, emotion and excitement to commemorate 30 years of creativity and contribution of the Schools to education. 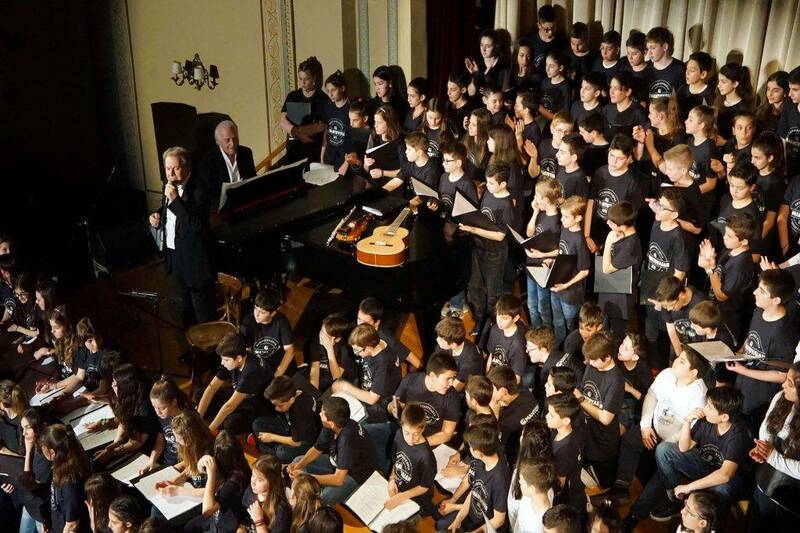 Dionysis Savvopoulos, the leading troubadour, shared his excitement about this collaboration with members of the orchestra and choir of Mandoulides Schools, and members of the choir of children with special abilities "En Dynami,"stressing that it was his childhood dream to play with such a virtuoso student ensemble, and wished Mandoulides Schools another 30 years of creativity and enlightenment. 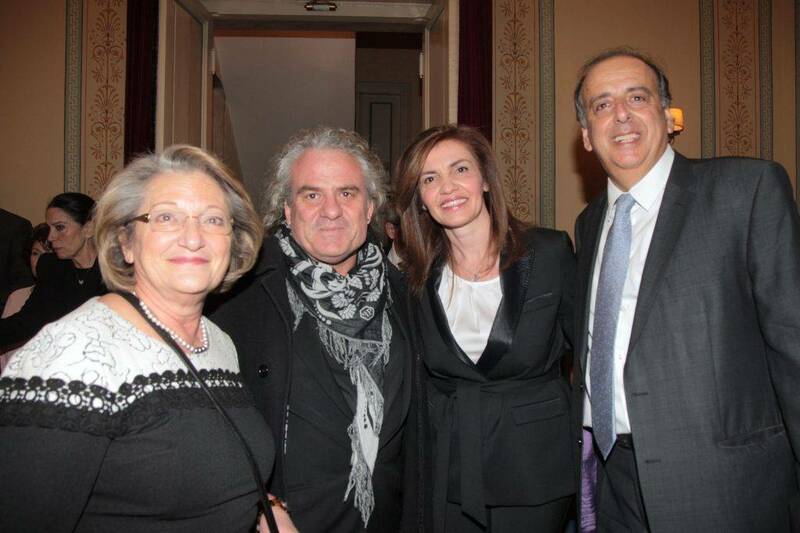 He also congratulated the orchestra director Gianni Polymeneri and the choir director Eleni Theodoridou, for their important work. 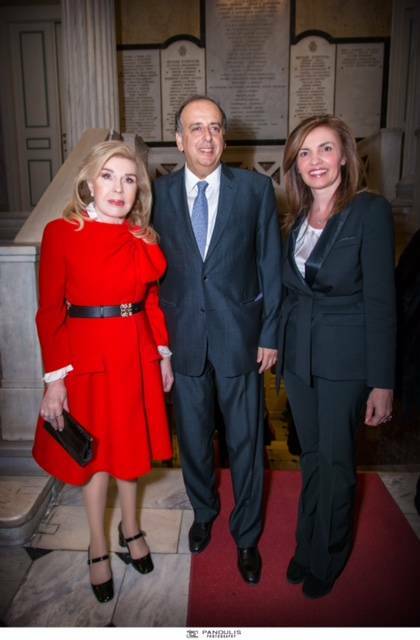 In the event the President of Mandoulides Schools Mrs. Aikaterini Mantoulidou addressed a greeting confirming that she, her family, and the colleagues of the Schools will continue the important work that began 30 years ago led by her partner and founder of the Schools, Evangelos Mantoulidis. 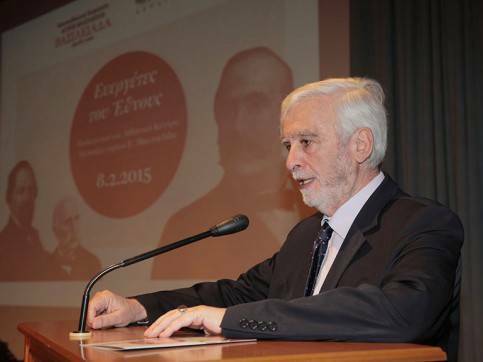 Director of Mandoulides Schools and philologist Aspa Hasioti, who coordinated the event, with journalist and author Kostas Mpliatkas, made remarks in honor of the history of the Schools, the teacher and visionary, Evangelos Mantoulidis, and the official guest Dionysis Savvopoulos. 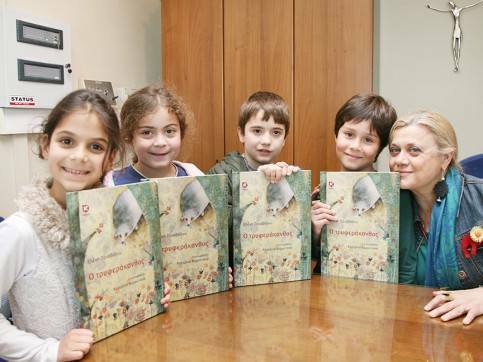 Mandoulides Schools celebrated its 20th Anniversary with the special publication of a book that confirms the Schools’ creative presence in the educational life of Thessaloniki. 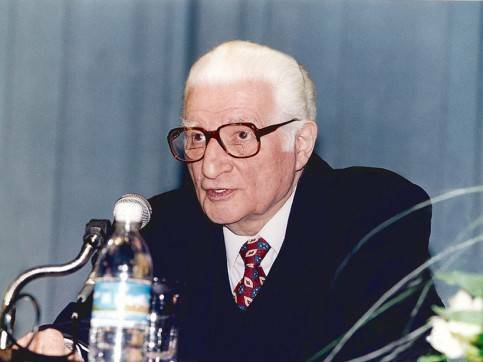 The book, entitled “Thessaloniki, Through Writers of the Past,” was presented by Minister of Culture Evangelos Venizelos, writer Nikos Bakolas, Aristotle University Professor of Law Giorgos Anastasiadis, and publisher of the book Nikos Karatzas, head of Ianos, S.A, while excerpts were read by Alexis Kostalas. 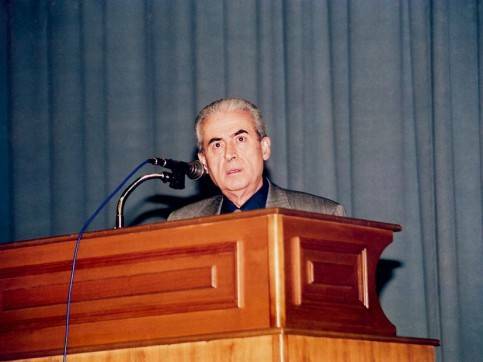 Remarks on the pedagogical role of Mandoulides Schools were made by the Minister of Culture, founder of the Schools Evangelos Mantoulidis, Professor of the Philosophy School of Aristotle University Ioannis Hassiotis (representing parents of the first students of the Schools), and philologist of the Schools Aspa Hasioti. 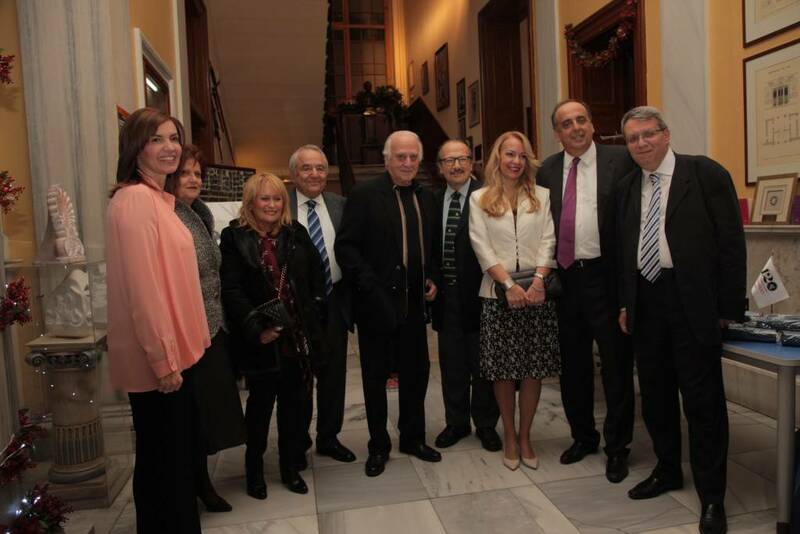 In a heartwarming honorary event, the Cappadocian Association "Agios Vasileios - Vasileiada” and Mandoulides Schools recognized four important Greek figures for their distinguished service to Thessaloniki and Hellenism: Yiannis Demirtzoglou, Director of the Zografeio Lykeio of Istanbul and Archonta M. Referendario of the Great Church of Christ; Anastasios and Ioulia Mpillis, great benefactors; and Nikolaos Papageorgiou, great benefactor, Honorary Chairman of Papageorgiou Hospital, President of the Papageorgiou Foundation, and Archonta Referendario of the Great Church of Christ. 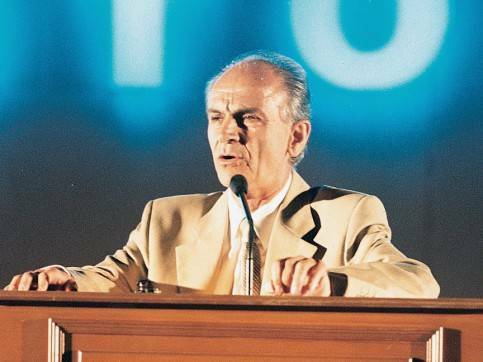 Ioannis Tsoukalas, Emeritus Professor of Aristotle University and a Member of European Parliament, together with author Giorgos Skampardonis, spoke of the timeless presence, work and contribution of these Greek benefactors. 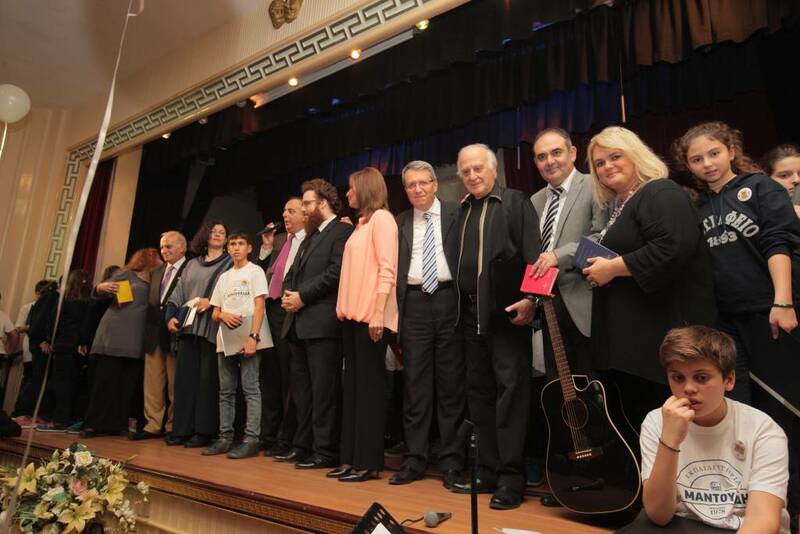 Mandoulides Schools organized an event honoring the outstanding educators of Thessaloniki as part of the celebration of 100 years since the liberation of Thessaloniki, under the general title "Thessaloniki, City of Great Educators." 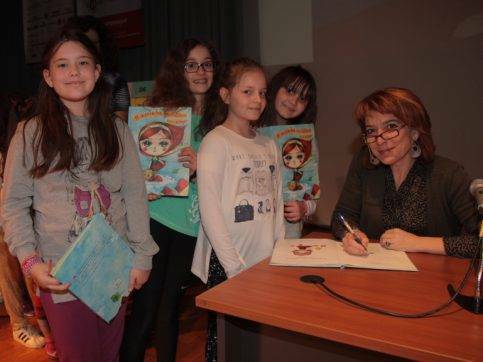 Biographies and works of great educators who influenced the development of the Greek language were presented at the event, held at the Cultural Center of the Schools. 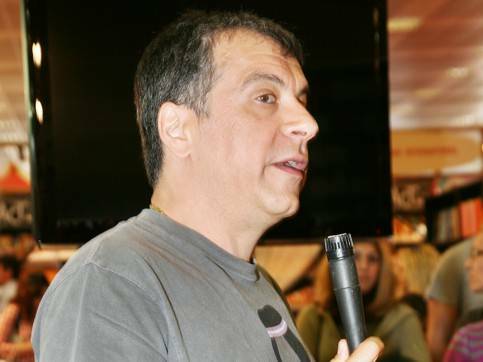 Speakers included renowned professors, journalists and authors such as: Giorgos Anastasiadis, Giorgos Papanastasiou, Kostas Bliatkas, Giorgos Dellios and Thomas Korovinis. Through special video and photographic material, prepared and presented by students of the Senior High School, extensive reference was made to the biography and works of Manolis Triantafyllidis, Dimitris Glinos, Alexandros Delmouzos, Gianni Kakridis, Linos Politis, Emmanouil Kriaras, Christos Tsolakis and Evangelos Mantoulidis. The literature and discourse programs that Mandoulides Schools implement each year aim to broaden the horizons of students, enriching their knowledge, cultivating team spirit, and using new technologies to prepare them for the demands of our times. 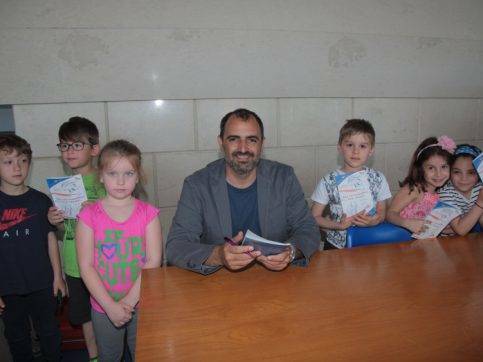 Within the framework of the Bookmates program, students of Day Care Center - Kindergarten have the opportunity to become acquainted with books, authors, and illustrators of a publishing house during a school year. Thus, the book becomes a game, joy, knowledge, communication, an act of creation. 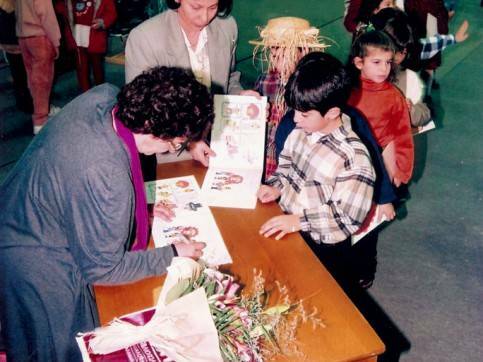 From 1994 through 2006 the reading program was pioneered in cooperation with Ianos and included the following programs: Reading Rally, Literature in Education, Give Me Your Book, World Days and Literature, Literature Writes about History, Literature Writes about Society, Literature Writes about the Olympiad, Lessons of Thessaloniki, Literature on the Silver Screen - History on the Silver Screen, Aesop Was the Beginning, Re-Reading the Greek Classics. 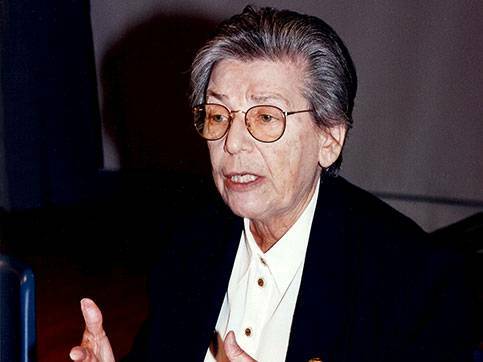 Through these programs, renowned literary figures made presentations at Mandoulides Schools: A. Varela, N. Dimopoulos, S. Zarampouka, A. Zei, M. Kontoleon, N. Bakolas, L. Petrovits - Androutsopoulou, E. Proviolou, Z. Sari, G. Skampardonis, G. Soureli, P. Sfyridis, E. Trivizas, E. Fakinou, T. Chortiati, and V. Hislop. Develop their spelling capabilities in a pleasant and creative way. 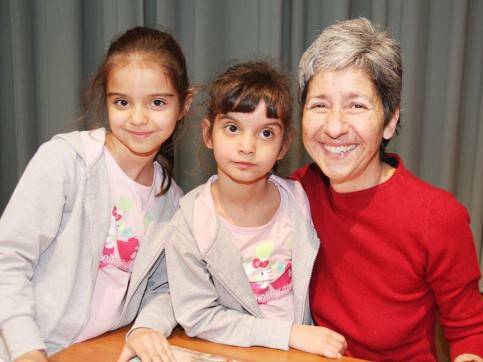 Enhance their interest and love for the Greek language. "Words write...History," but history has many interesting facts to tell us about the evolution of words over time, confirming the richness and the enormous range of our language. Under this program, our older students have a chance to interact with experts on issues directly affecting their interests, their concerns, their goals and aspirations each year. Under this program, 1st and 2nd grade students read literary books not only to practice in English, but also to enjoy reading and to share the joy with their peers, teachers and parents. 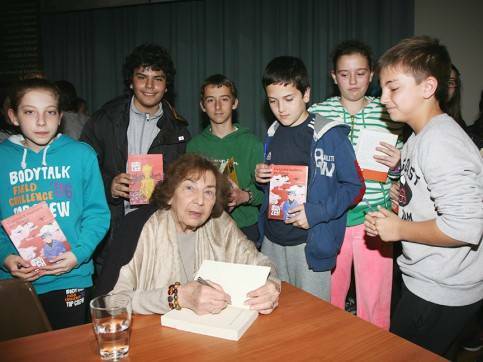 Within the framework of the Bookmates program, students have the opportunity to become acquainted with books, authors, and illustrators of a publishing house. In this way, books become associated with fun, knowledge, communication, creativity. Books become our best friends. 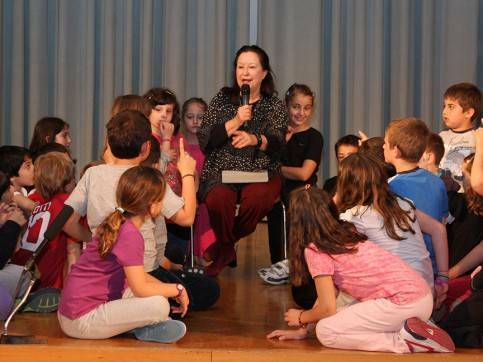 Mandoulides Schools promote students’ contact with the Seventh Art by presenting film-related programs titled Movie Camp, Cine Club, and Frame Rate, designed for students of the Elementary School, Junior, and Senior High School respectively. As part of their cinematic experience, students engage actively in dialogue immediately following each screening, exploring the themes of the script, the director’s outlook, and the students’ own personal impressions of the film. The discussions are moderated by talented actor and director Panagiotis Kountouras, with whose help a voyage into the magical world of cinema - in pursuit of meanings hidden within each film - begins. Movie Camp is a cinematic adventure that is expected to fascinate the viewers. It features a selection of films from different genres, each characterized by directorial excellence and a bold artistic approach, that have a common denominator: the inner journey of a hero. Screening include The Truman Show (1998, directed by Peter Weir), The Secret Life of Walter Mitty (2013, directed by Ben Stiller), and Inside Out (2015, directed by Pete Docter and Ronnie Del Carmen). 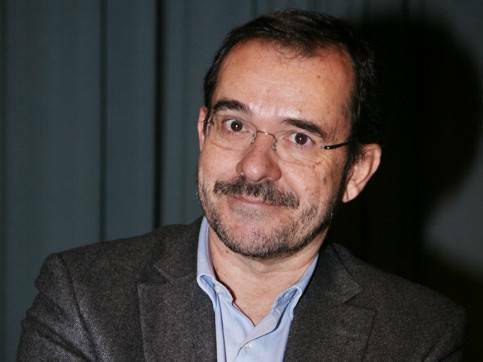 Cine Club illuminates exciting human stories that teach love through a particularly interesting point of view. Screenings include Cinema Paradiso (1988, directed by Giuseppe Tornatore) and Dead Poets Society (1989, directed by Peter Weir). Frame Rate explores ideas and attitudes of people in real stories and places that, thanks to the cinematic lens, remain unchanged over time. Screenings include The Wave (2008, directed by Dennis Gansel) and Slumdog Millionaire (2008, directed by Danny Boyle). Workshops, innovative educational programs, and book presentations are just a few of the activities that creatively fill Sunday mornings! 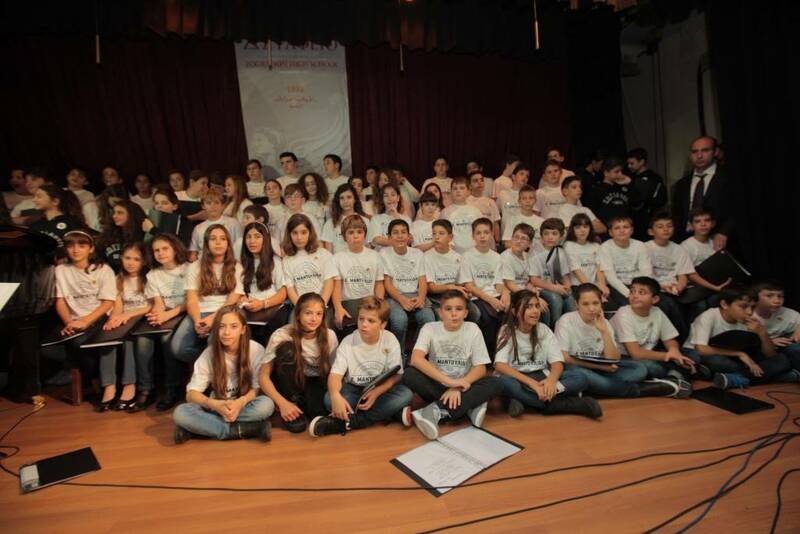 Mandoulides Schools’ theater group took part in the 2018 Panhellenic Art Competition, an annual event organized on the Schools’ premises for junior-senior high schools from Greece and the Diaspora to compete in theater, musical, and choral performances, as well as in poetry, painting, photography and video productions. This year’s theater presentation was an adaptation of Eugene Ionesco’s renowned play “The Bald Soprano” entitled “En Taxei.” It was awarded first place among the entries of 15 participating schools, and received particularly positive comments from the jury of the competition. In his comedy, rich in symbolism, the playwright describes the daily routine of bourgeois society, where incessant chatter blocks thinking. Through a simple, everyday story of a British family, the author pioneers the achievements of the Theatre of the Absurd. Ionesco attacks a world that has lost its metaphysical dimension and that mocks fake conventionality, the inability of people to communicate, and the existential vacuum of man. Written in 1948, Ionesco’s comedy is now more relevant than ever, as it satirizes themes such as the degradation of personal identity, the adoption of slogans by the masses, as well as the recipes for ideas that fuel and transform societies into automatic machines. 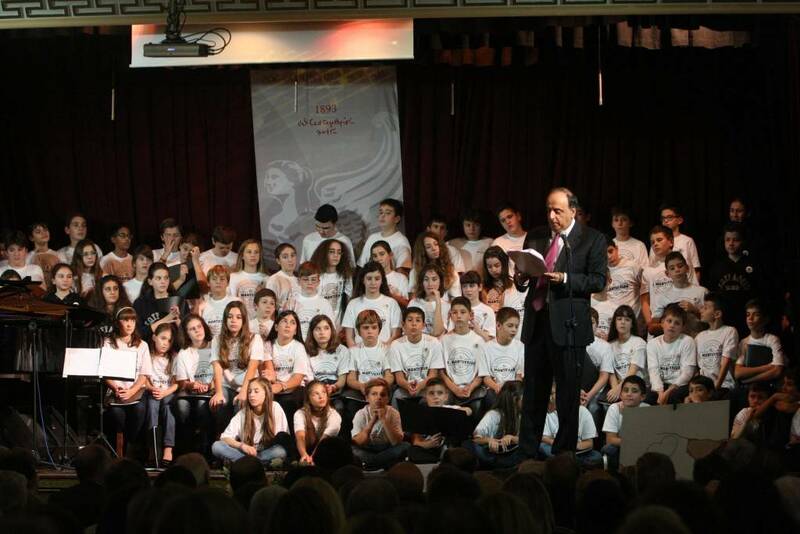 Madoulides Schools Drama Club, as part of of the Panhellenic Art Games held in our school, presented a novel by Georgios Theotokas, "Leonis", a performance with which they won the third honorary position in the Games. 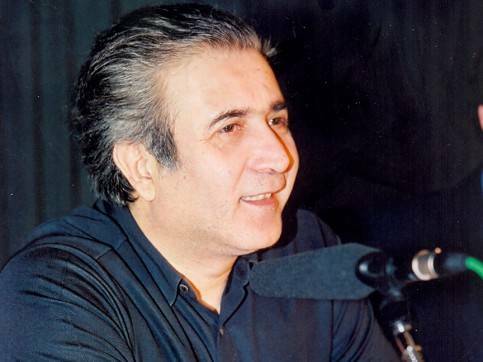 One of the most characteristic works of Theotokas, "Leonis" is the author himself but also the sensitive teenager who was born and raised under the shadow and sound of the First World War. 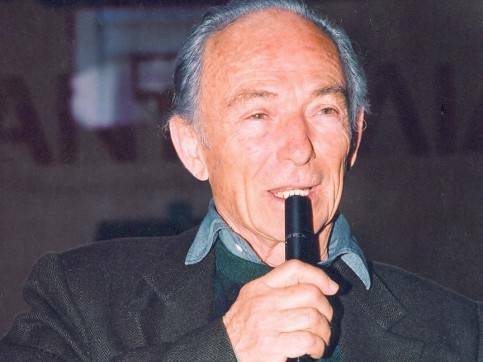 In Leonis, which was written in 1940, the author describes Constantinople, his childhood and his forced fleeing after 1922. These are all memories of paradise, a hymn to a lost paradise. Everything is magical. People, events, places. All childlike and fairytale. The main character of the book is Leonis, who describes his birth city and reminisces about it when he is forced to abandon it in 1922. The other hero of the book is Constantinople. The City, as described in the book, is directly related to Leonis. 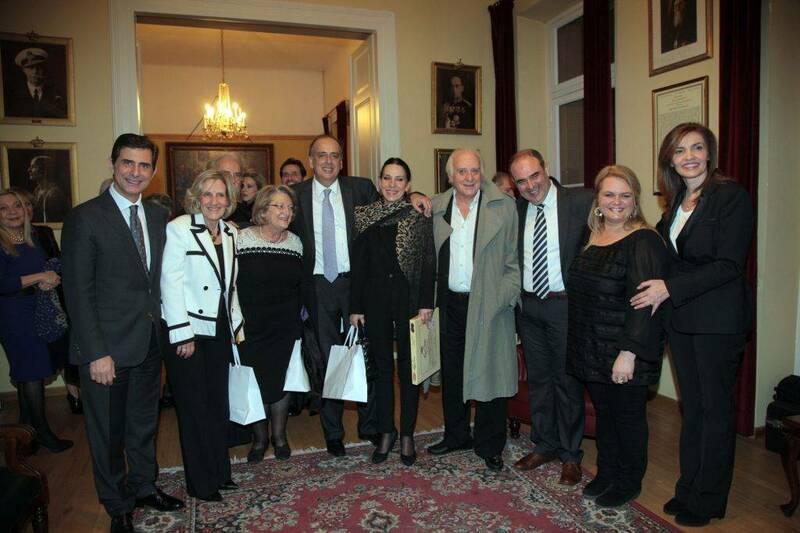 It is the city through the eyes of the hero, the high society and the author's family, who seems to support Venizelos. It is the City of the First World War of the period 1919 - 1922 that will shape the life of our little hero. The novelty that Leonis brought to teenage literature lies in this magnificent reconstruction and representation of the spirit and climate of a shocking era where History played the leading part. 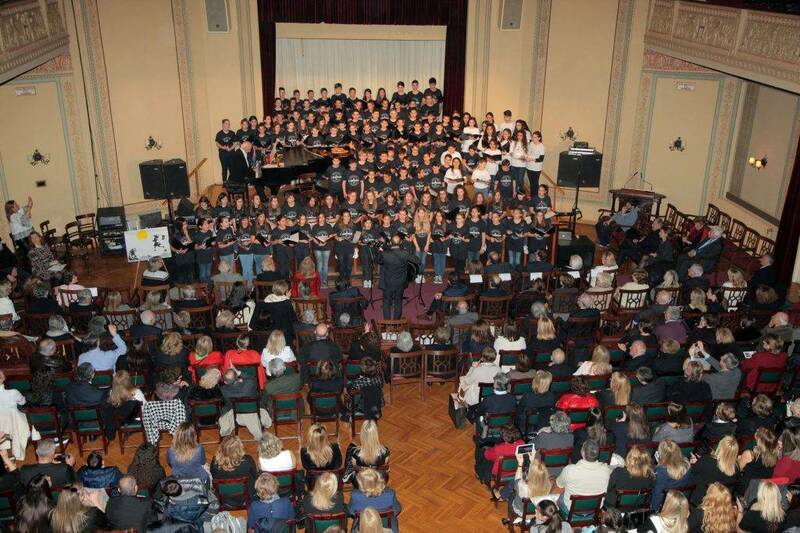 The Drama Club of Mandoulides Schools Junior-Senior High School participated in the "Art Days" Festival organized by Pierce - The American College of Greece, on April 11 - 14, 2016, in Athens. The theme of the festival, "Water, Source of Life or Cause of War? 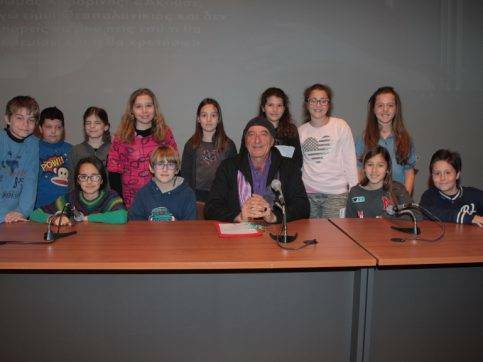 ", Inspired 14 schools from Greece and a school from Smyrna to present their work in one of the following artistic fields: painting, photography, theatre, music. Both our musical ensemble "Echochromata" with the musical performance "Flow, Water and Come to Get Me ..." as well as our Drama Club with its production of Yannis Kalavrianos’ play "Sons and Daughters" stood out with their perfect preparation and impeccable presentation of their work! The presence of the artistic groups of our Schools was remarkable, they received particularly welcoming and enthusiastic comments from the organizers and extended applauses from the audiences! 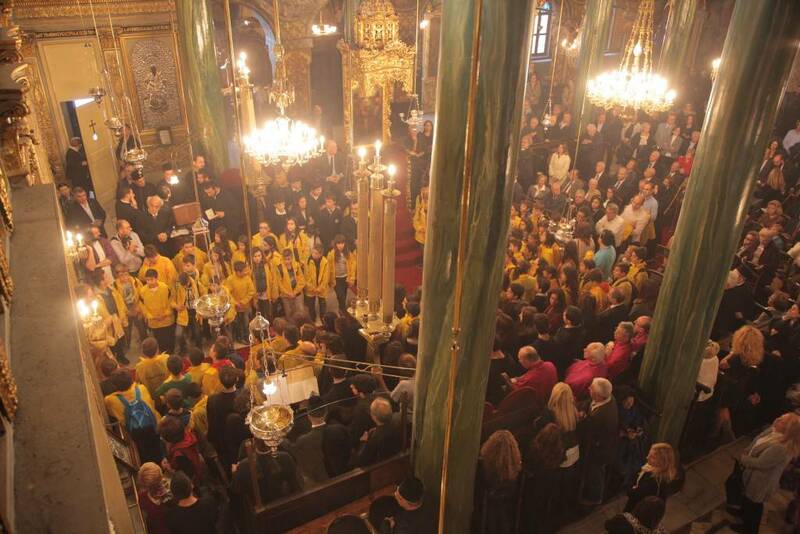 Our Schools’ theater group, within the framework of the student conference "G. Vizyenos: The Road to Istanbul,” held in Zografeio Lykeio in Istanbul under the auspices of the Ecumenical Patriarchate, presented the masterpiece of Georgios Vizyenos, "His Life’s Only Journey." 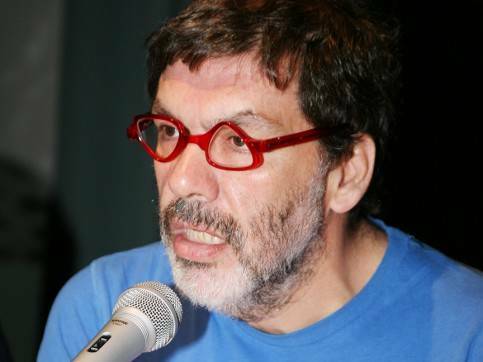 In one of the most and charming and powerful stories written by the author, infused with humor and irony, G. Vizyenos journeys back to his childhood and embeds intense experiential stories into the work by describing the harmless and weak-willed character of his grandfather and the authoritarian and oppressive nature of his grandmother. Our students received praise both from the participants of the G. Vizyenos conference in Istanbul, and from the students and judges participating in the first Art Competition, organized by Mandoulides Schools, where their performance was awarded first prize. 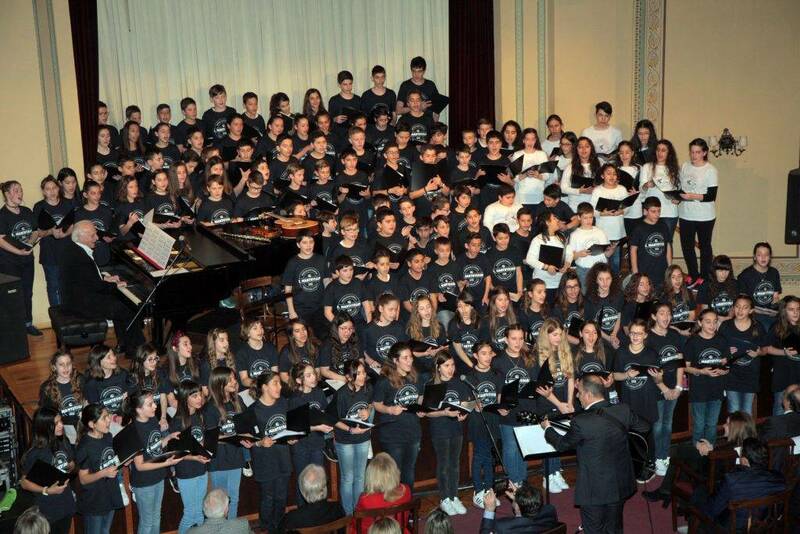 The Schools’ artistic groups collaborated in the musical titled “Stis lismonias ta meri...” directed by Eleni Dimopoulou. 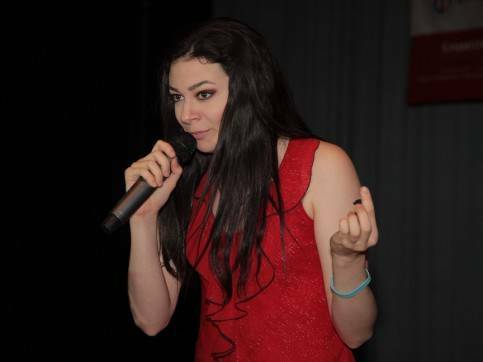 It was proposed that the show be set under the auspices of the UN Refugee Agency (UNHCR), after the outstanding praise it received from representatives of the UNHCR during the student festival “Days of Art - Spring 2014” at Pierce - The American College of Greece, in Athens. 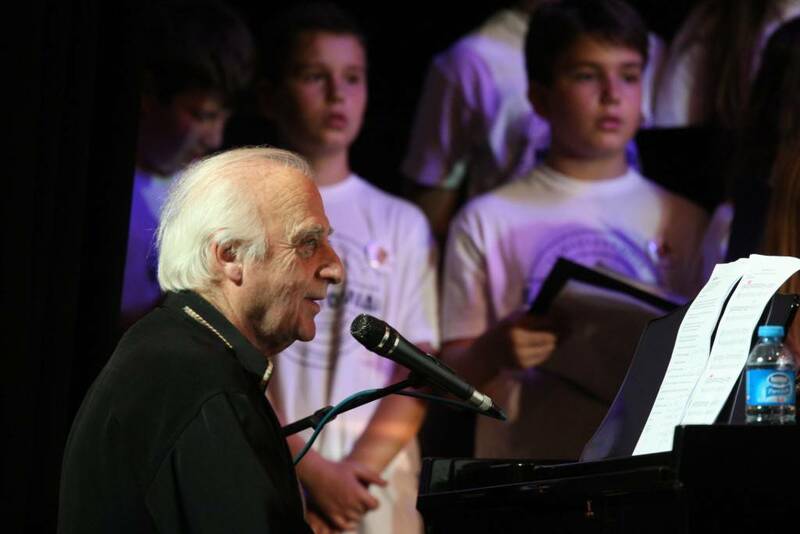 Mandoulides Schools’ theater group presented the theatrical performance “At Love’s Beckoning: Based on Cavafy’s lyrics,” within the framework of the student conference “150 Years of Constantine P. Cavafys” that took place in Istanbul under the auspices of the Ecumenical Patriarchate. Theatricality is an element that characterizes Cavafys’ poems and is noticed not only as an external element in the direction of plays, but is also found in the essence of the poem, coloring the thoughts and actions of each character. In this way, Cavafys manages to breathe life to his poems, thus drawing the reader in. Theatricality is an element that often penetrates deep in Cavafys’ work to unearth the foundations of the character of persons within his poems. Mandoulides Schools’ theater group presented the play "Murderess: The First Murder" by Alexandros Papadiamantis, adapted and directed by Eleni Dimopoulou. 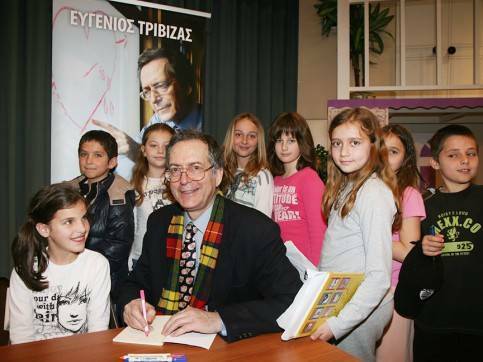 This play was presented at the student conference "100+1 Years Alexandros Papadiamantis," held by Zografeio Lykeio and Mandoulides Schools, with the participation of students, teachers, professors, writers and artists in March 2012. 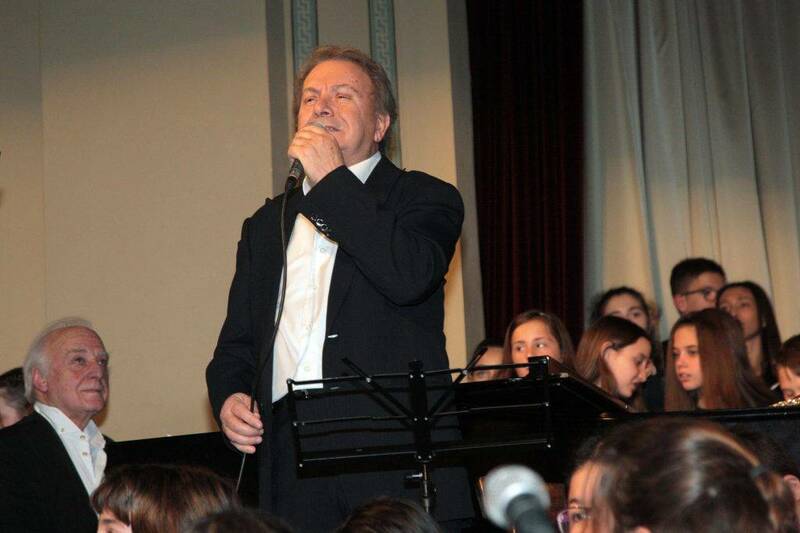 In a theater of song and painted dreams titled “Making a Brand New Year," along with musicians, singers, dancers and stilt walkers, the great songwriter Dionysis Savvopoulos invited all those who feel like children to "stop being mere spectators and get into history to make it brand new." Student - volunteers took part in the performances held on 09 - 10/04 and 16 - 17/04/2011 at Thessaloniki Concert Hall with balloons, firecrackers and songs. 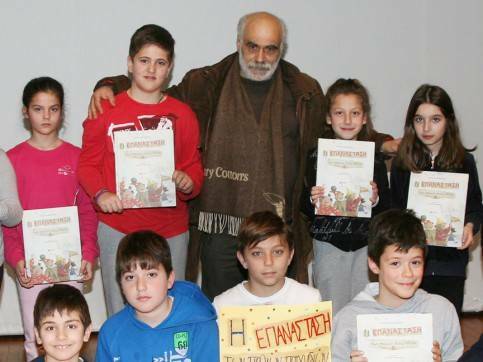 Mandoulides Schools theater group presented one of the classic works of Greek literature, Pinelopi Delta's "Trelantonis." This is a wonderful play with an optimistic and hopeful message, particularly relevant to the hard times we are going through. Delta's masterpiece tries to make us all active parties in an age of innocence and purity. The play is put on by the Junior - Senior High School theater group and is directed by Eleni Dimopoulou while the original music was written by Kostas Vomvolos. The play "Tale without a Name" was presented by Mandoulides Schools’ theater group at the end of school year 2009 - 2010, directed by Eleni Dimopoulou and choreographed by Melpo Vasilikou. 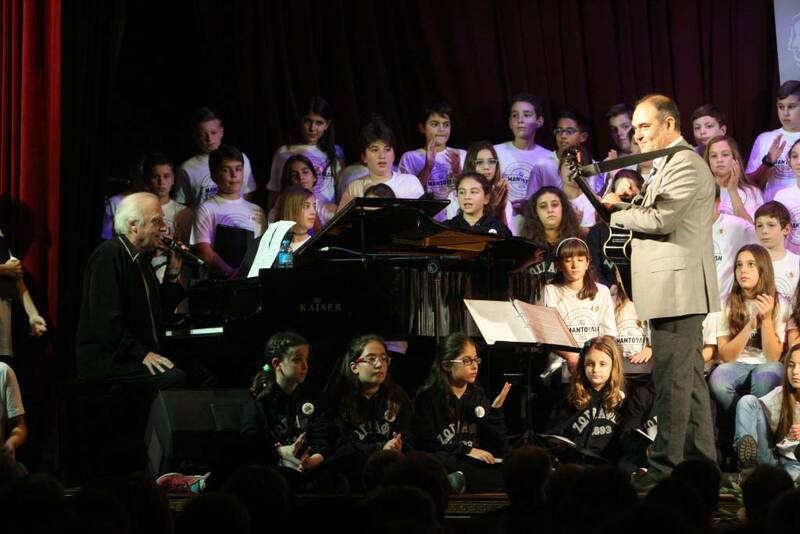 The Schools’ choir and orchestra also took part in the play, performing unforgettable songs by Manos Hadjidakis, under the direction of Eleni Theodoridou. In addition, members of the En Dynami group participated through their cooperation with student volunteers at Mandoulides Schools. The budding actors, who are children with special abilities, put topical messages across to the audience and were applauded with enthusiasm and emotion. 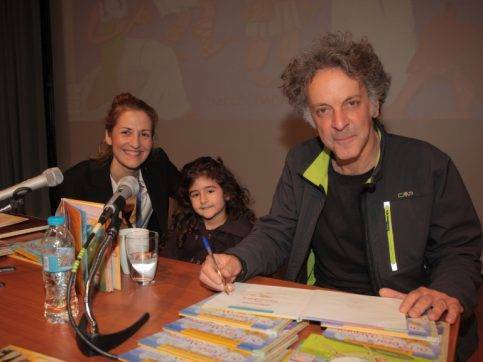 The show was presented again during the 45th Dimitria Festival in the Schools program in Thessaloniki; as well as at the Zografeio Lykeio in Istanbul. 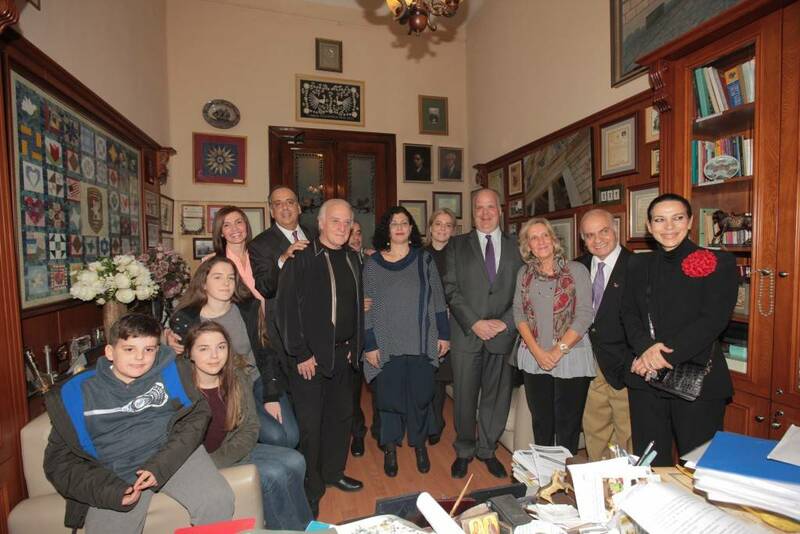 A cast of students, teachers, parents and alumni presented the play "The Dining Room," by A. Gurney to a wide audience as part of the celebration of 30 Years of Mandoulides Schools. 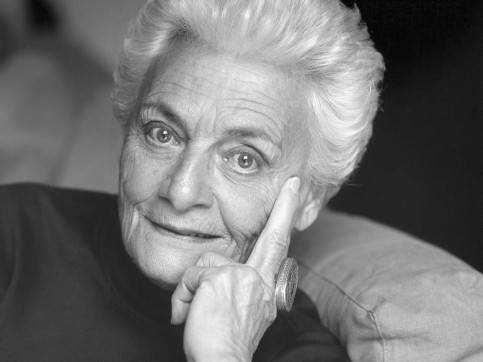 The play was directed by Eleni Dimopoulou. Children Drawing on the Wall ... with George Hatzinasios at the Philological Association "Parnassos"
The students of 6th Grade have travelled to Istanbul in order to present the musical performance “Singing in Istanbul ... with Thanasis Polykandriotis”, accompanied by the orchestra and choir of Zografeio Lykeio of Istanbul. 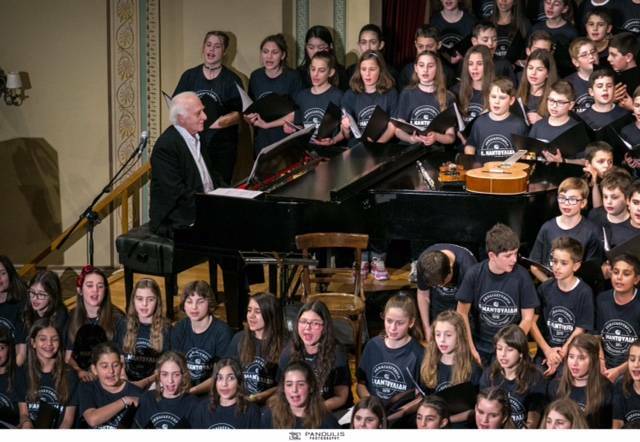 The students of Zografeio Gymnasio - Lykeio of and the 6th Grade of Mandoulides Schools experienced unique moments as they shared the stage of Athens College - Psychico College with the renowned singer Kostas Makedonas and his six-member band, on Monday, 26 March 2018, at 19.30. 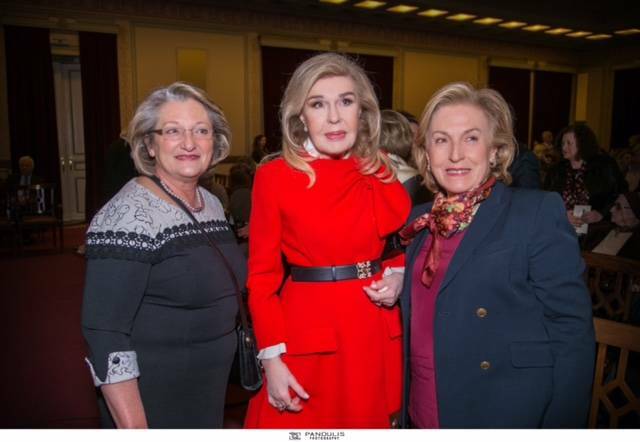 The event was held with the kind support of Panhellenic Women's Organization "PANATHINAIKI" (Neo Psychiko department) and aimed at reinforcing the work and actions of Zografeio Lykeio, the historical school of Istanbul. 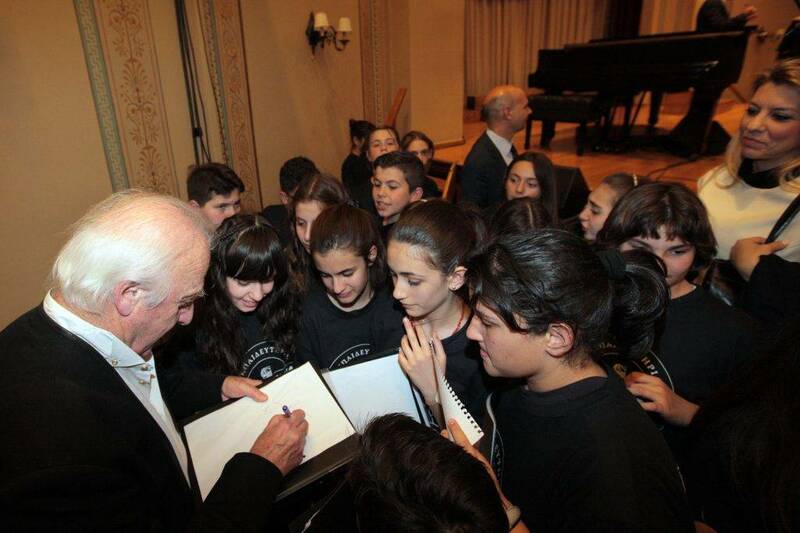 Students of Zografeio Junior High School of Istanbul and the 6th Graders of Mandoulides Schools experienced unique moments as they shared the stage of the Philological Association "Parnassos" with the distinguished composer George Hatzinasios to present the show "Children Drawing on the Wall ... " on Monday, March 13, 2017. The large audience that attended the show was enthused by the students, who gave their best and deservedly stood beside the leading creator. 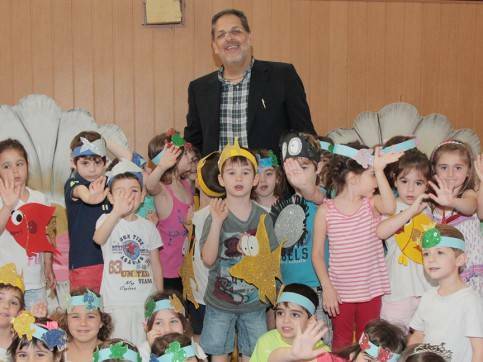 Both children and adults were pleasantly surprised by the honorary presence of the great singer Manolis Mitsias, who sang all-time classic songs along with the composer and the children. 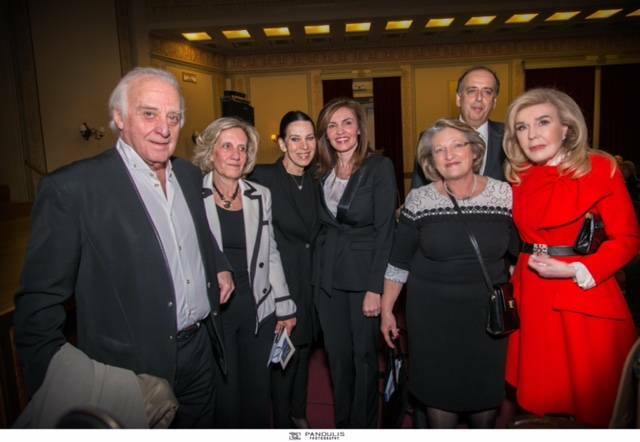 The event was held with the kind support of the Panhellenic Women’s Organization PANATHINAIKI (Neo Psychiko department) and under the auspices of the Philological Association "Parnassos". 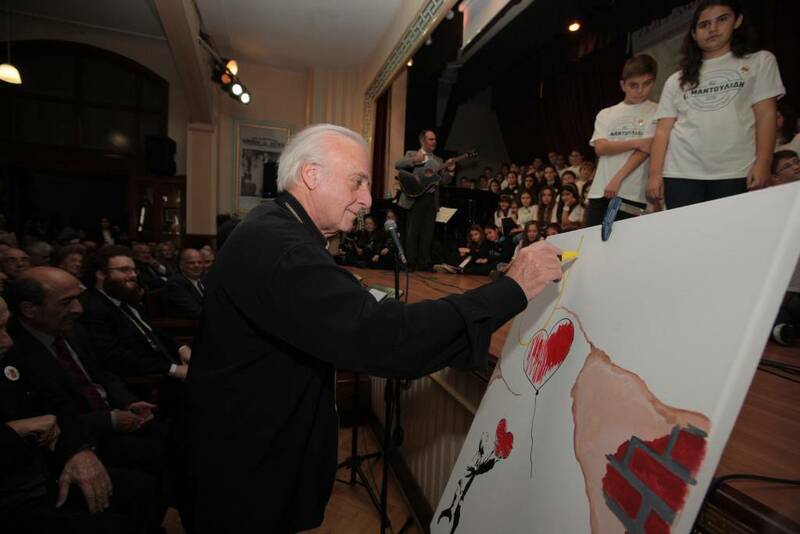 The vast audience, comprised of Greeks and expatriates alike, witnessed a unique experience by attending the anniversary event titled "Children Paint the Wall...with Giorgos Hatzinasios" in honor of the Virgin Mary of Pera and the 122 years since the founding of Zografeio Lykeio in Istanbul. 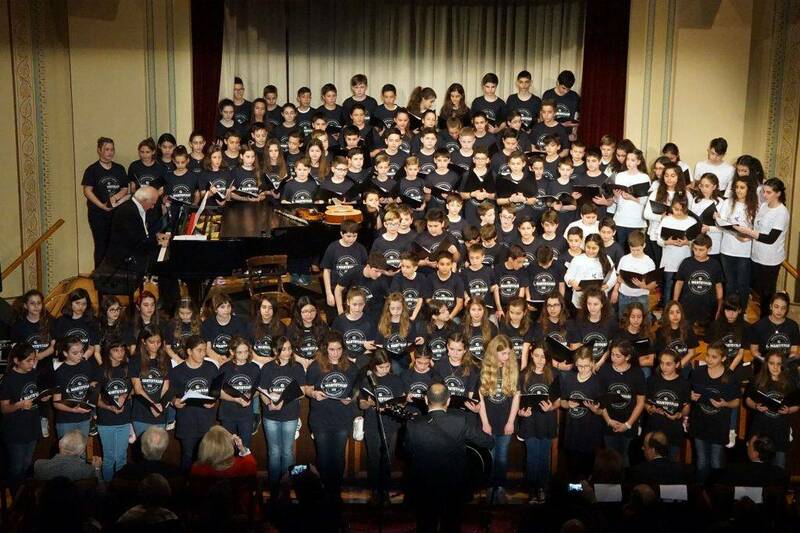 Mandoulides Schools’ 6th grade students traveled to Istanbul, met their fellow students of Zografeio Lykeio, and together they shared the stage with the leading creative artist Giorgos Hatzinasios, in an event with “colorful brushstrokes,” enthusiasm, and of course much good music. 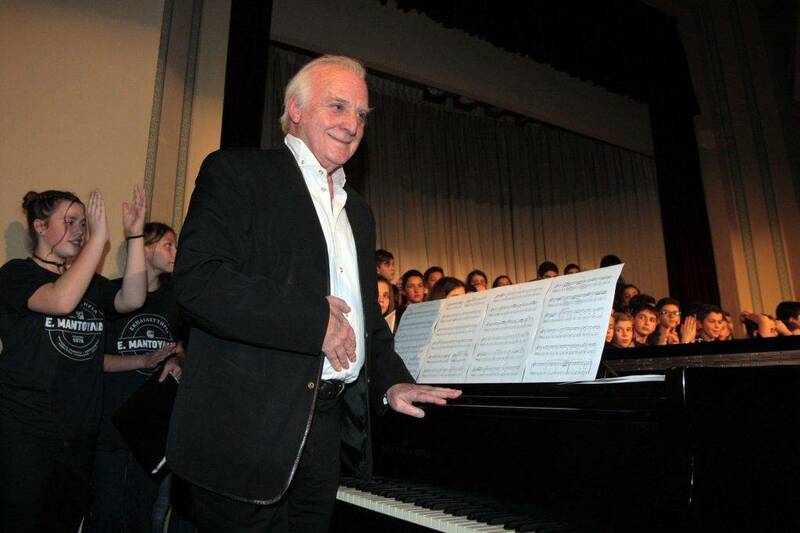 The show was held at Zografeio Lykeio in Istanbul where Giorgos Hatzinasios, before going on stage and sitting at the piano, added his own touch to the canvas painted by the children, to give a message of love and creative coexistence. 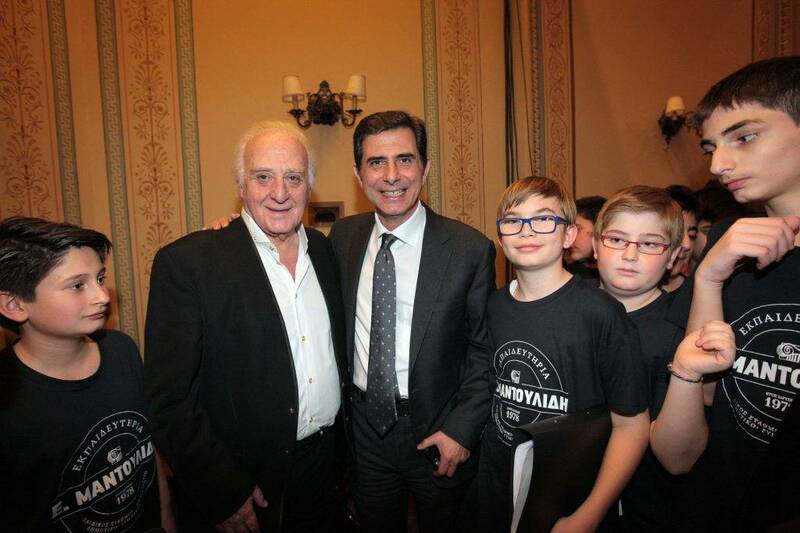 During the event, he was proclaimed by the Director of Zografeio Lykeio Yiannis Demirtzoglou as an "Honorary Zografeiotis" for his contribution to Greek music. 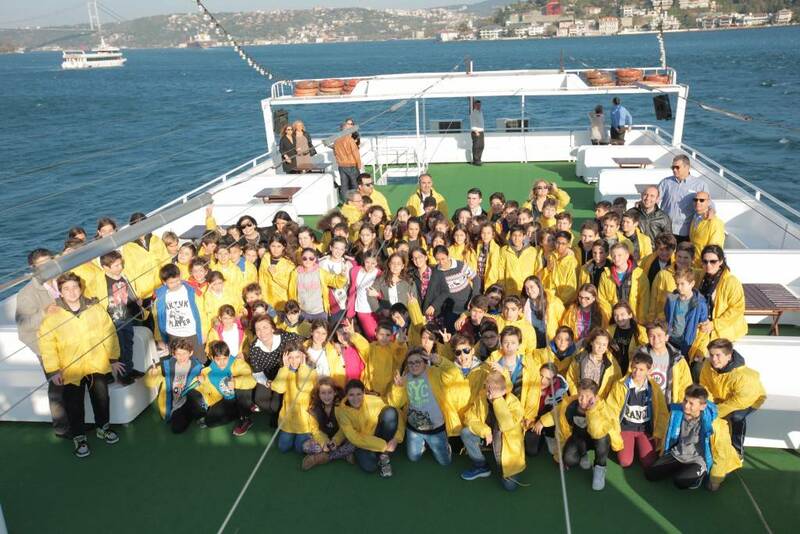 The student exchange program, under which students of Zografeio Lykeio of Istanbul were hosted by families of Mandoulides Schools’ students has been completed with great success. The aim of the program is for students from Istanbul to gain better knowledge of the Greek lifestyle, practice the Greek language, and create close bonds of friendship with their peers from Greece. During the 5-day trip students attended classes at Mandoulides Schools while they experienced Greek hospitality and the daily routines of the Greek family. 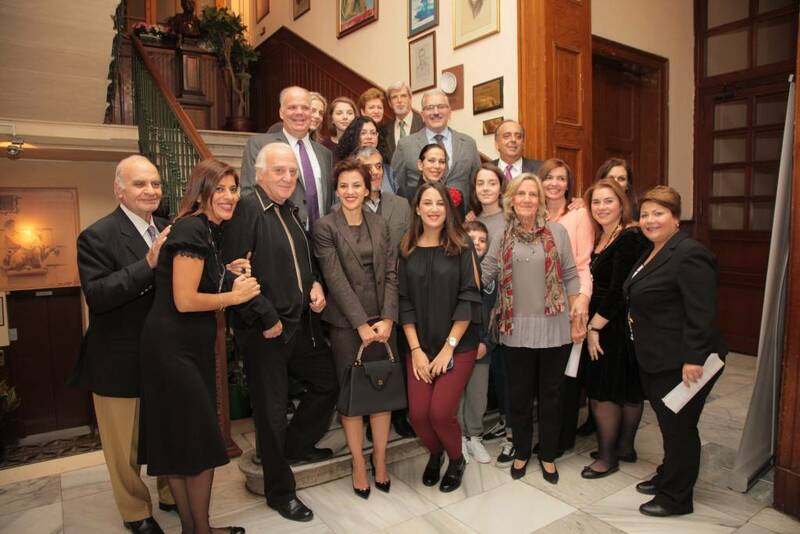 The Zografeio Lykeio students, accompanied by their Director Yiannis Demirtzoglou, the President of Mandoulides Schools Mrs. Aikaterini Mantoulidou, and the Schools’ Director Aspa Hasioti, were received by his Eminence the Metropolitan Archbishop of Neapolis and Stavroupolis Mr. Varnava and, after paying their respects at the Metropolitan Church of St. George, dined together. 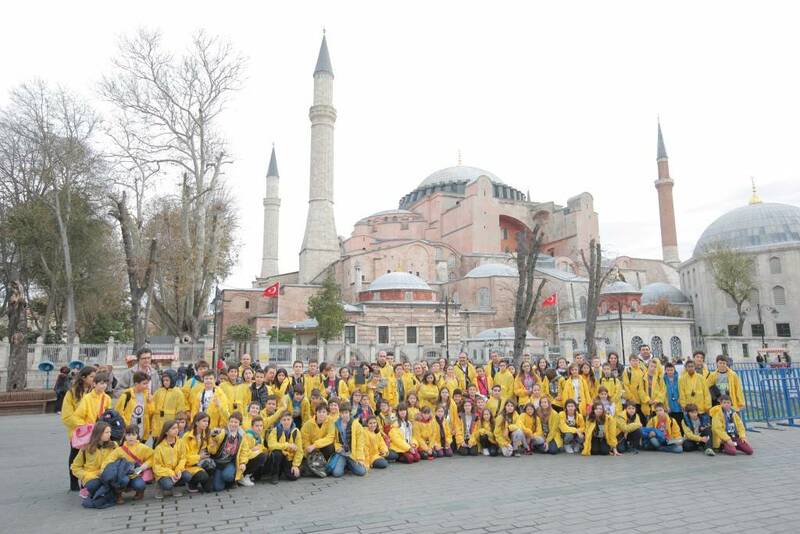 Before departing, the Zografeio Lykeio students, together with Mandoulides Schools students, biked along the Thessaloniki seafront near the White Tower, enjoyed lunch at Aristotle Square and seeing a film at a nearby cinema, and gave promises to one another to meet again both in Istanbul and in Thessaloniki. It was a journey full of love and emotion. 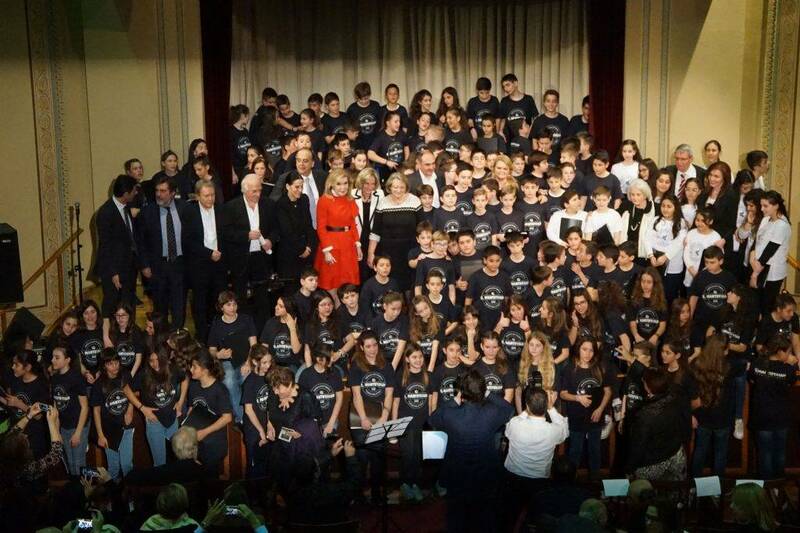 In an event where excitement and music dominated, hundreds of expatriates and Greeks applauded Dionysis Savvopoulos on the stage of Zografeio Lykeio of Istanbul, who was accompanied by students of the Zografeio Lykeio and 6th grade students of Mandoulides Schools. 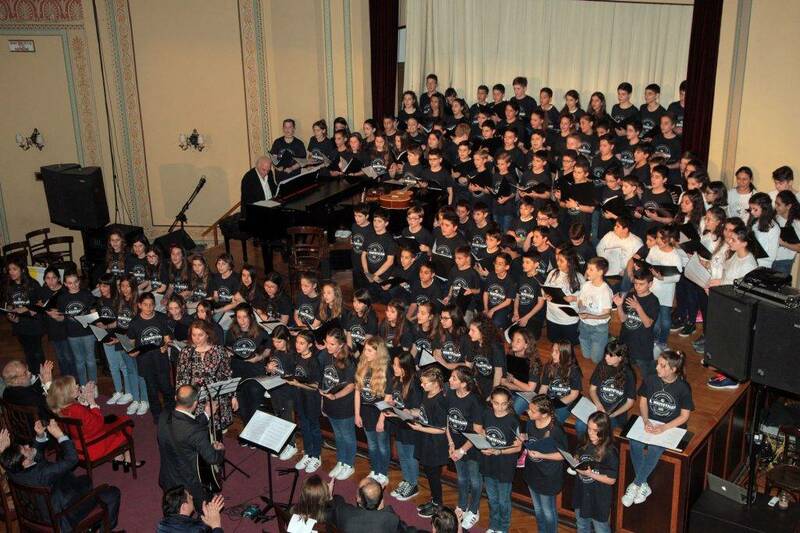 The students, in an original and imaginative way, greeted Dionysis Savvopoulos, the songwriter from Thessaloniki, who has family origins in Istanbul and who sang songs plucked from the common tradition of both cities. 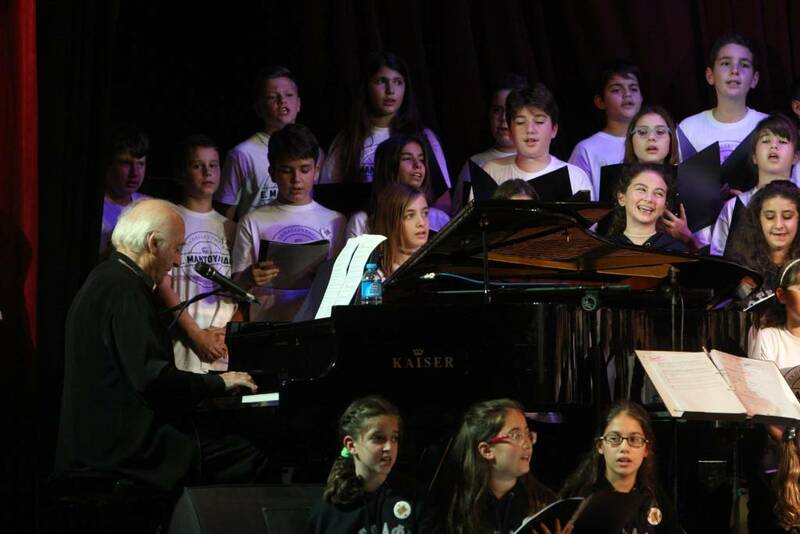 Dionysis Savvopoulos sang with the students, and shared memories and favorite stories of his father, George Savvopoulos, who lived in Constantinople. The story of the "Psomathianos" folk singer who was enchanted by fairies and lost his voice literally stole the show. 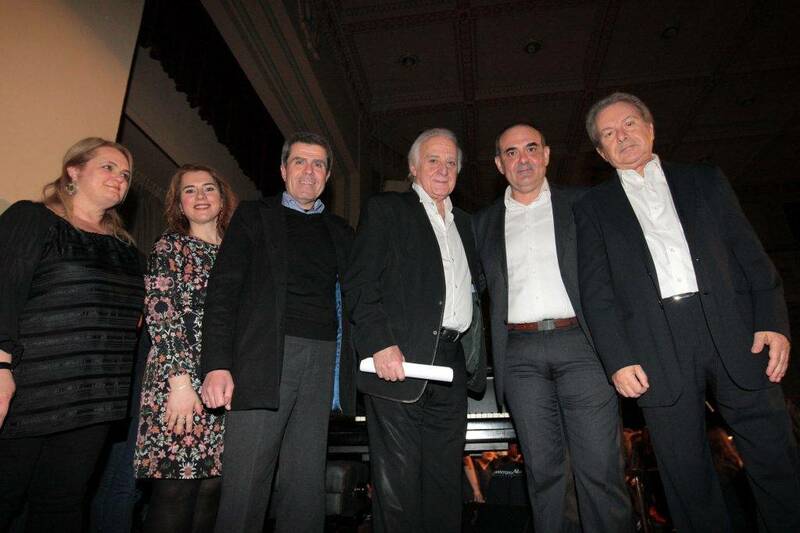 During the event Dionysis Savvopoulos was proclaimed by the Director of Zografeio Lykeio Yiannis Demirtzoglou an "Honorary Zografeiotis" for his 50-year contribution to the Greek song. The honorary plaque awarded by His All Holiness Ecumenical Patriarch Vartholomeos. 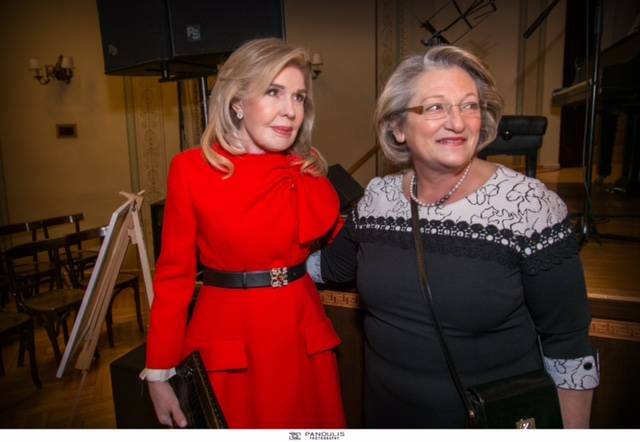 Zografeio Lykeio of Istanbul celebrated 120 years of operation and contribution to education and culture with a concert by Evanthia Rempoutsika on the evening of November 20th. 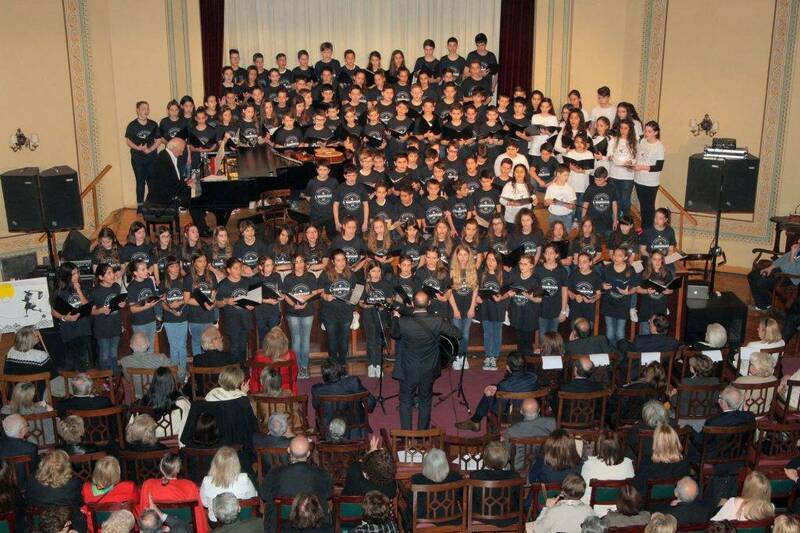 Zografeio Lykeio’s choir, Mandoulides Schools’ choir and the En Dynami choir participated in the concert. Sixteen students from the Zografeio Lykeio and 71 students from the 5th grade of the Mandoulides Elementary School experienced an unforgettable event, as they presented the stunning musical "A Magical City," based on the fairytale by Eleni Priovolou, written specifically for the Zografeio Lykeio and Mandoulides Schools students’ musical. 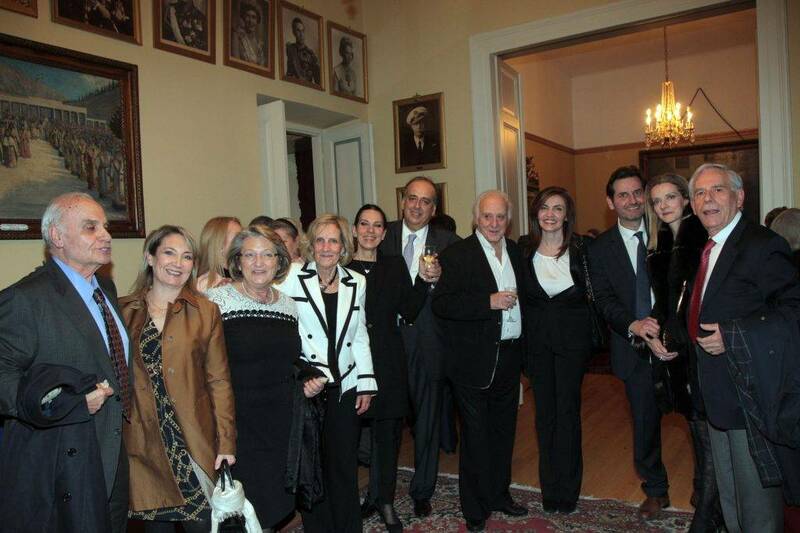 A large audience of both expatriates and Greek nationals visiting Istanbul attended the play "Tale without a Name" performed by the theatrical group of Mandoulides Schools in the events hall of the historic Zografeio Lykeio of Istanbul, within the framework of the events for the celebration of the Virgin Mary, held in that historical school. 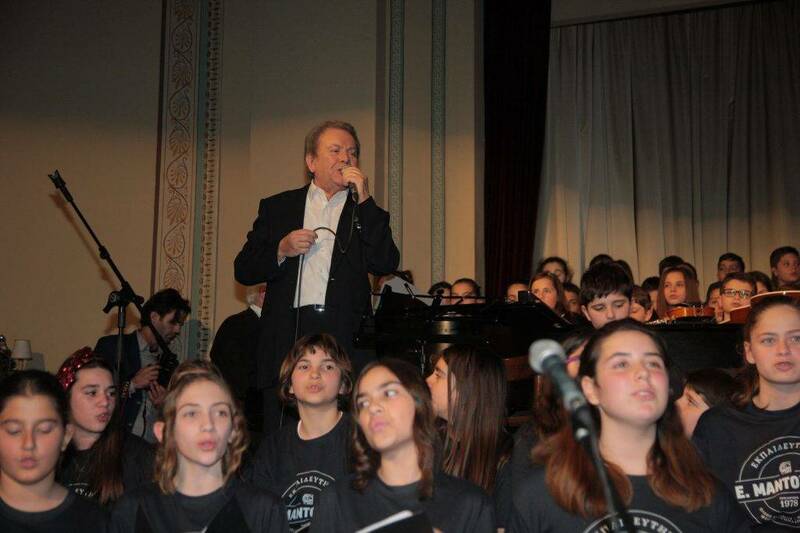 Mandoulides Schools and the historic Zografeio Lykeio of Istanbul organized an extraordinary concert with the participation of the singer Dionysis Savvopoulos, accompanied by the orchestra and choir of Mandoulides Schools as well as the choir from Zografeio Lykeio, at the ceremonial hall of the Zografeio Lykeio. The event was honored by the high presence of His All Holiness the Ecumenical Patriarch Vartholomeos.